← Utah Symphony’s ‘Great American Road Trip’ Tour Coming to Bluff! Planning to visit Utah’s Canyon Country with your family this fall and looking for things to do? This list of family-friendly activities is for you! Bluff Fort Root Beer & Baked Goods! **If you’re a geocaher, don’t miss the cache hidden on the grounds at the fort- one of five official San Juan County caches included in the Visit Utah Geocache Program. 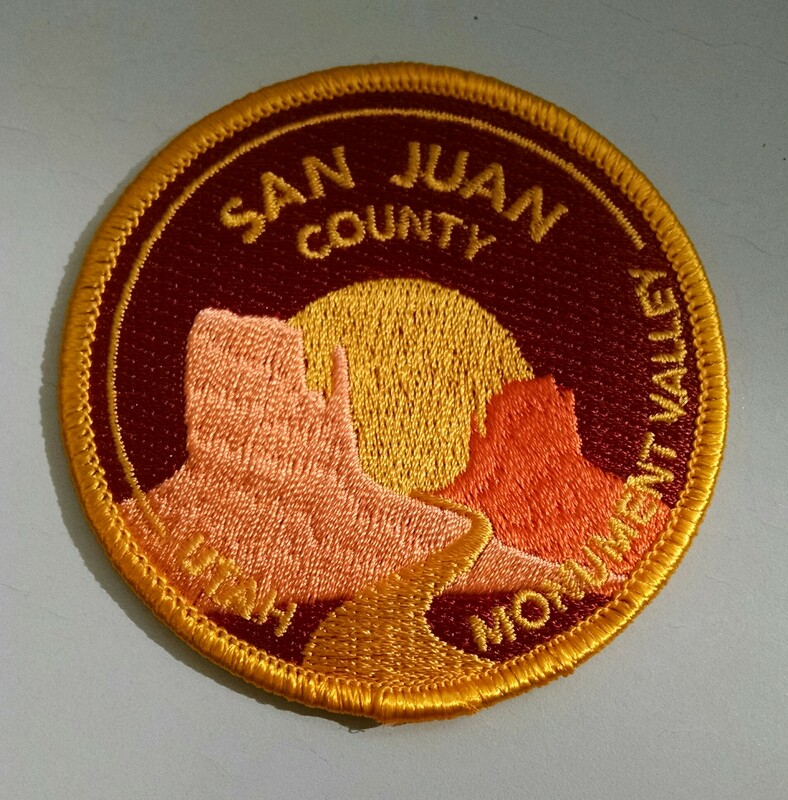 If you find at least 3 of the 5 caches in any county in the state, you’ll receive a custom made county patch! Read more about the program and the San Juan County geocaches HERE! There’s no better way to enjoy the summer in southeast Utah, than a float trip on the San Juan River! Book a trip with Wild Rivers Expeditions and sit back and enjoy the scenery and Class II & III rapids while your guide expertly navigates the river. Highlights including stops at archaeological sites such as River House Ruin and the Butler Petroglyph Panel, as well as viewing 300 million year old fossils, and desert bighorn sheep are sure to keep your kids entertained! Often mistaken for Horseshoe Bend on the Colorado River, at Goosenecks State Park the San Juan River twists and turns through sinuous ‘goosenecks’ as it flows toward Lake Powell traveling over 6 miles, while it advances to the west only 1 mile. The Great Goosenecks of the San Juan River is the largest entrenched river meander in North America- it’s Horseshoe Bend times three! Monument Valley, spread across the Utah/Arizona border at the southern edge of San Juan County, is one of the most photographed places on earth! It’s been featured in films, as the eye-catcher for ads, and on television, and the best way to see it in person is on a guided tour with one of the many tour companies in the valley, where guides will teach you about the Navajo history & culture of the area, as well as the Hollywood film history. Open air vehicle tours, horseback riding tours, ATV tours, take your pick- just make sure to go with a guide to get the most out of your visit! While in Monument Valley, be sure to stop by the Stagecoach Restaurant at Goulding’s Lodge for one of their delicious Navajo Tacos. Based on the sheer number I’ve consumed over the years, I consider myself to be a Navajo Taco connoisseur, and these are THE BEST Navajo Tacos around! Geared toward kids ages 4 yrs and up, the Jr. Ranger booklet at Natural Bridges National Monument is one of the best in Utah! (trust me- I’ve done a lot of these booklets around the state with my son!) And your kids will have no problem completing it in this small 7,636 acre monument. With a short 8 mile loop road taking you through the heart of the monument, it’s easy to get up close and personal with all 3 bridges- Owachomo, Kachina, and Sipapu. 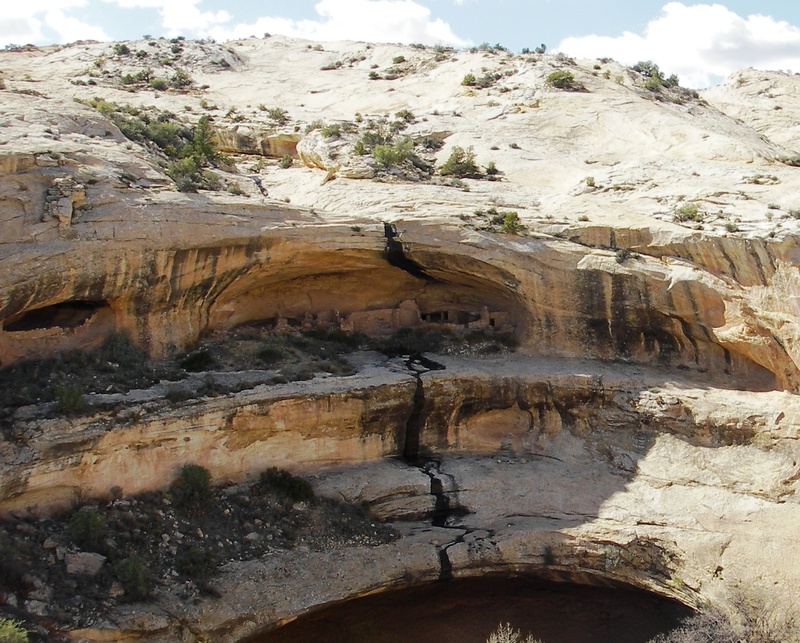 Whether you check out the bridges from the overlooks, or take the short hikes down to each, Natural Bridges may very well be the highlight of your family’s trip to Utah’s Canyon Country! Thanks to its extreme photogenic nature and proximity to the highway, House on Fire has become one of the most popular archaeological ruins in southeast Utah. The round trip hike of less than a 3 miles with no noticeable elevation gain, is the perfect length for kids. Upon arrival, visitors can witness the phenomenon that this ruin is named for- the colorations on the rock above the ruin that give the appearance of smoke and flames coming out of the roof, which is enhanced by the lighting early in the day. A photographers dream- this ruin won’t disappoint! Just don’t forget your camera! Located approximately 15 miles west of Blanding on Hwy 95, Butler Wash Ruins is a great, quick stop to check out an amazingly preserved cliff dwelling site. Built by the Ancestral Puebloans in approximately 1200AD, this site includes habitation, storage, and ceremonial structures including four kivas. While parts of this site have been stabilized and reconstructed, the majority of the site remains as it was found in the late 1880s. Round trip hiking distance to the overlook is approximately 1 mile. The Dinosaur Museum in Blanding is my 5 year old son’s absolute favorite place EVER! We’ve been to quite a few dinosaur museums in the area including Moab Giants and the Prehistoric Museum at USU Eastern in Price, and The Dinosaur Museum in Blanding is still our favorite! Open mid-April through mid-October each year, The Dinosaur Museum features exhibits including ; skeletons, fossilized skin, eggs, footprints, and sculptures of dinosaurs from the Four Corners region and throughout the world. The highlight of the museum is the 14 ft tall Therizinosaurus, a towering feathered dinosaur with a 20 foot wingspan, that dominates the special exhibits room. One of my favorite parts of the museum, which seems very unexpected in a small town in southeast Utah, is their huge collection of dinosaur movie posters from around the world. (Makes sense once you learn that the owners of the museum got their start sculpting dinosaurs for the motion picture industry!) The Dinosaur Museum in Blanding is a true hidden gem, and is sure to capture the attention and imagination of dinosaur lovers of all ages! Another must-see in Blanding, for both kids and adults, is Edge of the Cedars State Park. This park is made up of three parts; a world-class museum that houses the largest collection of Ancestral Puebloan Artifacts in the Four Corners area, a one-thousand year old Puebloan Village site located behind the museum, and the facility is also a federal repository housing artifacts from the area, as well as other parts of the country. Kids will love climbing the ladder down into the kiva located behind the museum, as well as exploring the children’s area- a large room full of books, puzzles, drawers with various activities, and hands-on play areas including a Puebloan dwelling where they can stack ‘stones’ to build their own walls. As you visit the structures representing each of the groups, it offers a great opportunity for kids to learn about the diverse cultural history of southeast Utah. And be sure to visit the observation tower in the center of the site for spectacular views on the surrounding countryside! The Canyon Country Discovery Center is a science and nature center, with indoor and outdoor learning stations. Developed for culturally diverse audiences, the facility allows children and adults to explore and discover the natural history and landscapes, people and places, land use and energy, astronomy, water, and climate of the Colorado Plateau. The center also houses a rock-climbing wall, nature playscape out front, and numerous walking trails on the campus grounds. From Memorial Day through Labor Day each year, locally made Cedar Mesa Pottery is hidden along the cart paths at the Hideout Golf Club. Rent a cart or walk the paths, (especially nice in the evening when the deer are out) and if you find a piece of pottery- it’s yours to keep! Kids will love the treasure hunt, and even if they don’t find a piece of pottery, chances are they’ll at least find a golf ball or two! At only .6 miles, this short loop trail is a great hike for kids. The trail first takes you past an old cowboy camp nestled in an alcove with tables, dishes, a cookstove, and many other items still in place. As you continue down the trail you’ll come to Cave Spring, which is one of the few year-round water sources in the area. If you look closely, a smoke blackened ceiling and pictographs confirm that this area was used by the Ancestral Puebloan Indians long before the cowboys came along. After passing Cave Spring, two ladders take you up onto the slickrock above and provide you with amazing panoramic views of the Needles Rock formations, North and South Six-Shooter Peaks in Indian Creek, and the Abajo and La Sal Mountains. This hike provides a great opportunity for kids to learn first-hand about the history of Canyonlands. Pothole Point is another great hike for kids in the Needles District of Canyonlands. Again, at only .6 miles, there’s no time for kids to get bored on this hike, especially if you go after an early spring or late summer rain when the potholes are full of water and creatures such as Fairy Shrimp, Beetle larvae, Tadpoles, Snails, and Tadpole Shrimp. Since water never lasts long around here, the potholes provide a great opportunity for learning about the lifecycle and adaptations of these desert dwelling organisms. For children ages 5 and up, there’s also the Junior Ranger Program that they can complete to earn a special Junior Ranger Badge! Just pick up a booklet at the Visitor Center when you arrive! This list could go on and on, but these are my top 13 picks for the best family-friendly activities in Utah’s Canyon Country in the southeast corner of the state. For more ideas, click, ‘Things to do with kids‘ in the tag cloud on the right hand side of the blog or feel free to contact us at: info@utahscanyoncountry.com. This entry was posted in Blanding, Bluff, Bluff Fort, Canyonlands, Canyonlands National Park, Edge of the Cedars, Hiking, Monticello, Monument Valley, Museums, National Monuments, National Parks, National Parks & Monuments, Navajo Tribal Parks, Off the Beaten Path, San Juan River, Things to do for FREE!, Things to do with kids, Tours, Tours/Guided Trips, Travel, Utah and tagged Blanding, Bluff, Bluff Fort, Canyonlands National Park, Edge of the Cedars, Goosenecks State Park, Monticello, Monument Valley, National Monuments, National Parks, Needles District, Off the Beaten Path, San Juan River, State Parks, Things to do for FREE!, Things to do with kids, Tours, Travel, Utah. Bookmark the permalink. I’ve got to revisit the Bluff Fort soon. You captured the best of this region. Nice job! =) Oh and check out my blog to Iceland!